Preliminary figures released today by the International Civil Aviation Organization (ICAO) indicated that the total number of passengers carried on scheduled services reached 3.7 billion in 2016, a 6.0 per cent increase over last year. The number of departures rose to approximately 35 million globally, and world passenger traffic, expressed in terms of total scheduled revenue passenger-kilometres (RPKs), posted an increase of 6.3 per cent, with approximately 7,015 billion RPKs performed. This growth is a slowdown from the 7.1 per cent achieved in 2015. Over half of the world’s tourists who travel across international borders each year were transported by air. Air transport carries some 35 per cent of world trade by value. More than 90 per cent of cross border Business to Consumer (B2C) e-commerce was carried by air transport. The forecast of world real gross domestic product (GDP) growth in 2016 is expected to be at around 2.4 percent, down from the 2.9 per cent pace projection at the beginning of the year. The revision is due to sluggish growth in advanced economies, stubbornly low commodity prices, weak global trade, and diminishing capital flows. Despite the weak economic conditions, global passenger traffic continued to grow helped by the lower air fares owing to the fall in oil prices. International scheduled passenger traffic expressed in terms of RPKs grew by 6.3 per cent in 2016, down from the 7.0 per cent recorded in 2015. 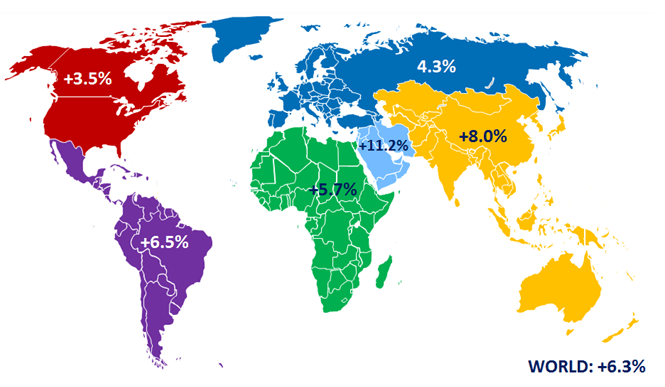 All regions, except for Africa and the Middle East, posted slower growth than last year. Europe accounted for the largest share of international RPKs with 36 per cent, and increased by 4.3 per cent. Asia/Pacific had the second largest share with 29 per cent, and grew by 8.0 per cent. The Middle East region carried 15 per cent RPK share and recorded a growth of 11.2 per cent compared to 2015. North America, with a 13 per cent share, experienced the lowest pace of growth among all regions at 3.5 per cent. Carriers in Latin America and the Caribbean managed 4 per cent of world international RPKs and recorded a growth of 6.5 per cent. Africa with a 3 per cent share saw an improvement from 2.3 per cent growth registered in 2015 to 5.7 per cent in 2016. In terms of domestic scheduled air services, overall markets grew by 6.2 per cent in 2016, down from the 7.3 per cent growth recorded in 2015. North America, the world’s largest domestic market with 43 per cent share of the world domestic scheduled traffic, grew by 4.9 per cent in 2016. Owing to the strong demand in India and China, the Asia/Pacific region, grew strongly by 10.0 per cent in 2016 and accounted for 40 per cent of world domestic scheduled traffic. The low-cost carriers accounted for approximately 28 per cent of the world total scheduled passengers in 2016 and passengers carried crossed the milestone of 1 billion passengers in 2016. LCCs in Europe represented 32 per cent of total passengers carried by LCCs, followed by Asia/Pacific and North America with 31 per cent and 25 per cent, respectively. The increasing presence of low-cost carriers notably in emerging economies have contributed to the overall growth of passenger traffic. Total capacity offered by the world’s airlines, expressed in available seat-kilometres, increased globally by around 6.4 per cent. As a result, overall load factor dropped slightly from 80.4 in 2015 to 80.3 this year. Load factor varies by region, ranging from 68.0 per cent for Africa to 83.3 per cent for North America. Load factor of the Middle East is under pressure with the continued strong capacity expansion outpacing the traffic growth. Load factor of the region is expected to decline from 76.3 per cent in 2015 to 74.7 per cent in 2016. Fuel accounted for nearly a fifth of the Industry’s operating costs in 2016, while it accounted for a third in 2015. Significant decrease in fuel costs helped airlines to maintain their operating profit at the same level as the previous year: the airline industry is expected to end 2016 with another record operating profit of around USD 60 billion and an operating margin of 8.0 per cent. This comes after an operating profit of USD 58 billion and an operating margin of 8.0 per cent in 2015. For a consecutive year, more than a third of the profits are expected to come from the carriers of North America, whose domestic market represents 66 per cent of their total operations. Improving economic conditions forecast by the World Bank will see traffic growth and air carrier profitability momentum continuing in 2017.